Lake Wakatipu – The Great KiwiCombo Pass. See New Zealand your way! The Queenstown region offers superb golfing opportunities, including international standard resort courses and an excellent range of local golf clubs. If you’re planning some time in Queenstown and wondering whether to pack your golf shoes, then don’t hesitate! The region offers an excellent range of golfing experiences that will delight recreational and scratch handicappers alike. The big hitting names include the well established and world-renowned Millbrook Resort and the newer designer Jacks Point on the shores of Lake Wakatipu. Millbrook is located15 minutes from Queenstown, near the historic Arrowtown village which is just 5 minutes away. This championship 27 hole course has been voted Best Golf Resort in New Zelaand in 2011, 2012 and 2013 by the World Travel Awards. Millbrook offers 5 star resort facilities including self contained villas, 4 outstanding restaurants and world class spa facilities which are ranked in the Top Ten Hotel Spas in the world. Millbrook ticks all the boxes, the golf is challenging – beware the long grass in the rough, it’s perilous! 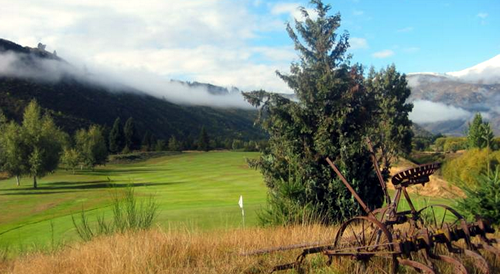 Arrowtown boasts its own golf club with a very distinctive flavor. A round there is a game of 2 halves, with the landscape of the front nine resembling a moonscape. A slightly wayward tee shot landing on a rock outcrop can have your ball pinging on to the neighbouring fairway. Across the road, the back nine is still challenging but less prone to unexpected surprises. 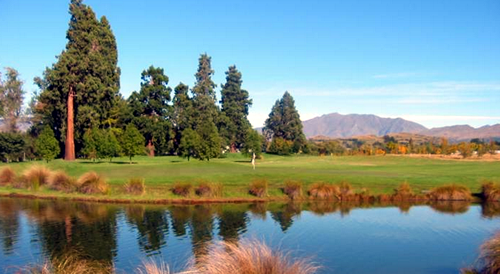 The Queenstown Golf Club is located on the Kelvin Heights peninsula, approximately 15 minutes’ drive from central Queenstown. The location is sensational with the Remarkables mountain range providing a rugged alpine backdrop and with long lake vistas across Lake Wakatipu. Excellent views from the top of the hill! Just an hour away from Queenstown, the Wanaka Golf Club is surely located on some of the best real estate in the region. Outstanding lake and mountain views of the Mt Aspiring National Park are easy distractions. The course is gently undulating with some elevated tees so expect a slow round if you have your camera handy! 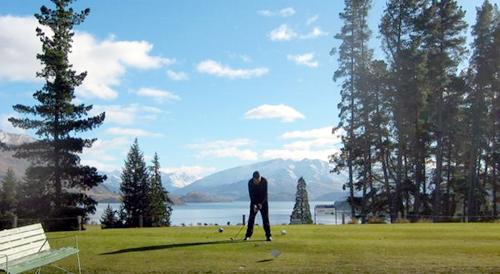 For a genuine local golf experience, enjoy the warm hospitality at the Cromwell Golf Club, a 45 minute drive from Queenstown in the heart of the Bannockburn wine region. A morning round followed by lunch and wine at one of the many boutique wineries can be a perfect day out. If you can’t guarantee your golf, you can at least guarantee to experience world-class wine! If you are looking for a truly rural experience, try a round at the Tarras Golf Club. You’ll be sharing the fairways with a local mob of sheep and need to be careful that you only hit the white ball, not any of the little black ones! A lot of fun, outstanding scenery, but you probably won’t want to put your card in! If playing a round at a resort or major club is a “must do”, then it would be prudent to plan your trip and have your tee times pre-booked so that you avoid tournaments and/or club events. Planning assistance is available to ensure a perfect balance between sightseeing and golf opportunities or you may prefer to take adventage of self drive golf itineraries that already have all the planning done. If you are on a freewheeling self drive holiday, then you’ll see ample opportunities to enjoy a local club round en route. Just call in. If the club house is unattended, you’ll see the honesty box and cards by the window! As for golf holidays in other regions? Watch this space!